Set in Camden Town across the 1970s and 80s, Alan Bennett’s film ‘The Lady in the Van’ tells the mostly true story of a lady who spent fifteen years living on Alan Bennett’s driveway. A fiercely independent woman, ‘Miss Shepherd’ played by the fantastic Maggie Smith leads the film with the right amount of comedy and sharp wit that make a lot of Alan Bennett’s scripts a true success. Smith is ably assisted by Alan Jennings who plays Alan Bennett – in both forms – as the person writing the story and the person living it. There are also cameos for all the cast of Bennett’s History Boys (the late Richard Griffiths providing the obvious exception, for obvious reasons). The social context of the film being reflected in the attitude of the middle class suburbia that surrounds it. Everyone is sympathetic to Miss Shepherd’s plight, though she will never tell them what the problem is. However no one, apart from Alan Bennett is prepared to offer her the hand of friendship simply by letting her park on their driveway, their conscience being relieved by trying to give her ‘hand me down’ clothes and the like. There is a lot to like about this film. It is apparent from the outset that ‘Miss Shepherd’ is not her real name, and very apparent that there is a darker reason for her aloof behaviour and occasional trips to Broadstairs. This coupled with a charming script hooks the viewer in. As with all Bennett scripts, humour is a key component though this is subtly juxtaposed with an underlying poignancy that ripples throughout. If there is to be any criticism it is that this film simply doesn’t know how to end. Do you end it when Miss Shepherd inevitably dies? The funeral perhaps? Alas, not. This is a film that keeps on going through to a very self-indulgant finish with a cameo from the writer himself as a plaque to Miss Mary Shepherd is unveiled. It’s a film I really enjoyed, but don’t let the comedy hide the fact that the story behind it all is incredibly sad – perhaps more so given the juxtaposition between Bennett’s own dependent Mother and the independence of Miss Shepherd. The story essentially is life – the highs, the lows and the inevitable end. A worthwhile watch – and a quintessentially British film. 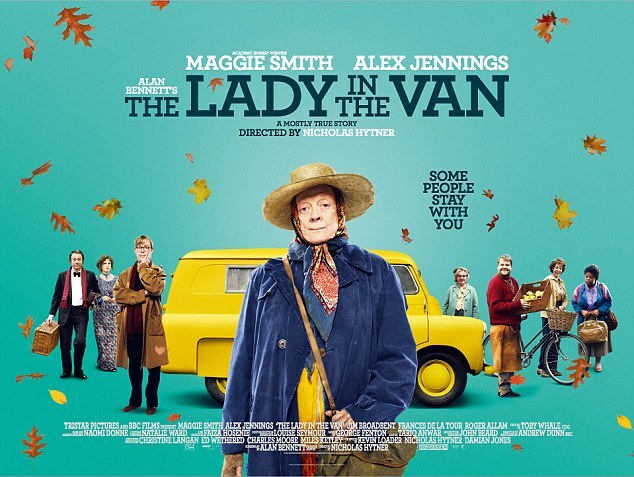 The Lady in The Van was released into UK cinemas on November 13th and is available to watch in cinemas nationwide.